From left: Brandon Hart, Sam McGowan, teacher Pamela Brooks, Alicia MacDonald, Hannah Coleman, Leah Oster, Kate Brown, and Keisha Laird help NDSS’s Interact Club sell treats and balloon animals as part of the National Cupcake Day campaign to support animal welfare organizations. Photo by Adam Bramburger. Students and teachers at NDSS were lined up outside the cafeteria last Friday in order to secure a tasty lunchtime treat for an important cause. Member of the school’s Interact Club set up to offer a variety of baked goods for National Cupcake Day, a fundraising campaign for the Ontario Society For the Prevention of Cruelty to Animals and sales were brisk. Following the initial rush, most flavours were sold out, leaving few cupcakes left for a sales blitz through the hallways. Club member Hannah Coleman said teacher Pamela Brooks brought the concept to club’s attention and its members saw the value in supporting animal welfare. “We picked it up and ran with it,” she said. Brooks, who had participated in the campaign in the past, spruced up the sales table by bringing fun animal hats for the sellers to wear and by creating signage so that all students and staff buying cupcakes could have their names displayed as contributors. 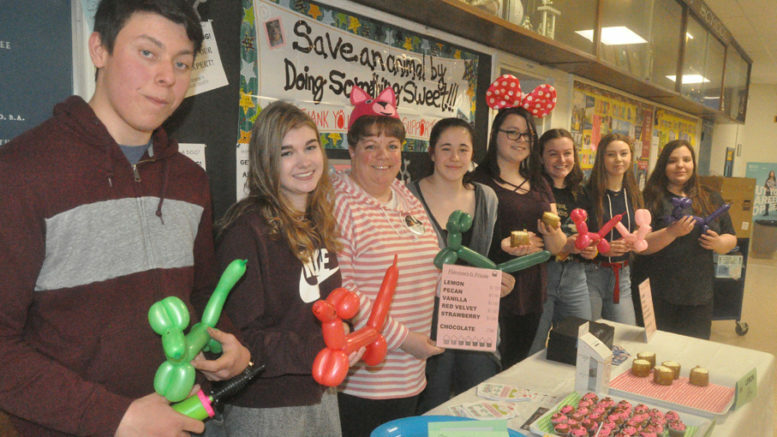 In addition to the sweet treats, the sale also offered some entertainment as Interact member Brandon Hart created colourful balloon dogs to sell for a minimum donation of 25 cents each. He also taught several of his fellow students the necessary twists to make their own canines at home. The Interact Club, a Rotary initiative for high school students, has about 15 active members at NDSS. Coleman said the group regularly works on fundraisers for community initiatives its members wish to support. Among the club’s major initiatives is its ChiliFest each November. After initially being hesitant to join a club at her school, MacDonald said she’s found the Interact Club a comfortable fit with a number of engaging, like-minded students working together. “It’s become a community,” she said. Officially, National Cupcake Day this year was Feb. 25, though groups like the Interact Club were encouraged to pick dates that worked for them. Across Canada last year, more than $700,000 was raised for animal shelters and humane societies, including the OSPCA. Since the campaign began, more than $3.15 million has been raised. The NDSS campaign took in more than $100. The Lennox and Addington OSPCA Animal Centre relies on community donations to support the lion’s share of its budget. The centre’s own volunteers took orders for cupcakes and sold them at Giant Tiger. Boyer GMC, Greenhawk Equestrian Sport, and several local veterinary clinics also took part in the fundraising initiative this year.